It’s been a year and many miles since I last posted about travel footwear. I’m still relying on my fleet of black sandals. And, as I write, I’m wearing my Bernie Mev woven shoes that pack small and go anywhere. On the other hand, the clogs and moccasins I mentioned in that post I save for home use only (now that I have a home). Our travel this year has prompted us to don new shoes and try new gear. Fortunately, before traveling to the Galapagos in April, I was treated to a pair of new water shoes. I absolutely love the Bzees footwear. They make lots of lightweight comfort shoes, but I chose these water shoes because I needed something that would withstand active use both in water and on land. I put this pair to the test. The Galapagos shores are mostly sharp volcanic rock, and Bzees’ Sea Dogs’ substantial sole carried me fine. Launching a kayak or landing a stand-up paddle board is a whole lot easier when your feet are protected. Because these Sea Dogs aren’t mesh, they don’t get loaded up with sand, as my previous pair of water shoes did. The Bzees shoes are machine washable, too, so the nasty fish smells can be eliminated. I’m abandoning my old water shoes for these, and I might try a pair of Bzees land shoes to fit my “city shoe” packing category. I’m also in the market for a second pair of Hoka One One running shoes. I’ve had mixed experience with these. I like the height and stability of the sole, or rocker. But over time I’ve found a little discomfort in my toes. I’m going to size up a half size if possible and report back. These worked well for our bike trip, as we weren’t clipped in. And I even got a compliment on my Hokas as I wore them around Paris! Apparently they were the invention of Frenchman and mountain runner Nicolas Mermoud. We recently updated our packs and luggage recommendations. After hiking in the Galapagos and biking in Brittany France, we both heartily second our nods to the Osprey and Camelbak hydration backpacks. So now it’s on me to get in running form. For the time being, I’m hydrating, biking, and…still walking. Good suggestions. It seems whenever I find a type of shoe I love, when I decide to buy more of them – they’re always discontinued! I need a pair that are comfortable and good for walking and riding horses. Bring back those Roper runners! Roper runners?! I used to have a pair of red Ropers I adored. Sounds like you have a tough bill to fill, to satisfy walking and riding. I’ve used my LA Sportiva for similar. Have you checked those out? Let me know what you end up with. 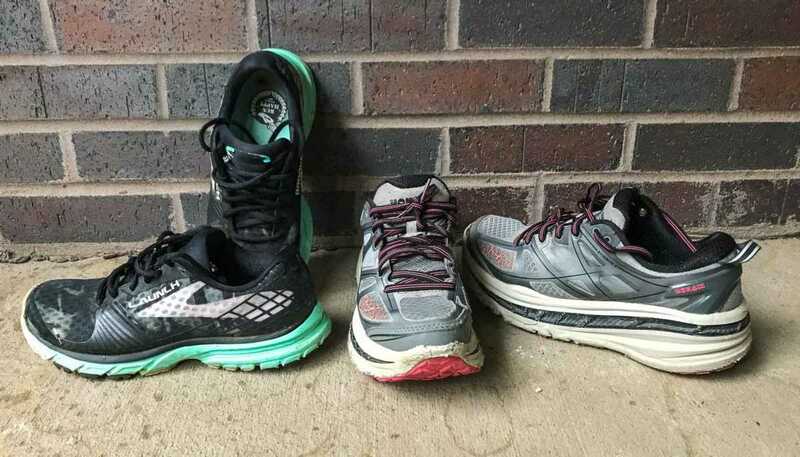 I too love my Brooks running shoes. They just have the right amount of arch support. So much so that I don’t even want to stray from them!